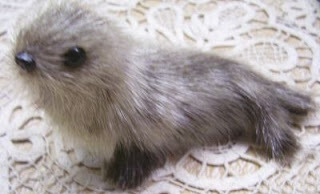 My oldest sister had a tiny seal like this, it was no more than 3 or 4 inches long. She kept it on the dresser in our bedroom. I am not sure if the fur was real seal fur or not. But it was cute. Posted by Karen at 12:53 p.m.